REI Flagship Displays PM Team, Callison Design, Several Local Vendors. Produce a complete wayfinding package for the parking garage, the walking and biking trails on the store’s perimeter, and some graphic elements inside, outside, and around the store itself. Design concept and elevations provided by REI and Callison. The garage consisted of 3.5 levels (PB, P1, P2 & P3) with 3 unique colors and identifying logos. We hired cleaning and painting vendors to power wash the entire garage and lay down primer on the walls and columns, and painted the perimeter walls white. We produced a full set of plotter cut, 1st surface, stencil graphics to act as painting masks. These, we applied to all columns and all locations called out by elevations. Painted appropriate colors in all called out locations, followed by stencil overlays for appropriate message painted in white. Produced all overhead signs using MDO, painted by local vendor, with plotter cut 3M vinyl used for messaging. 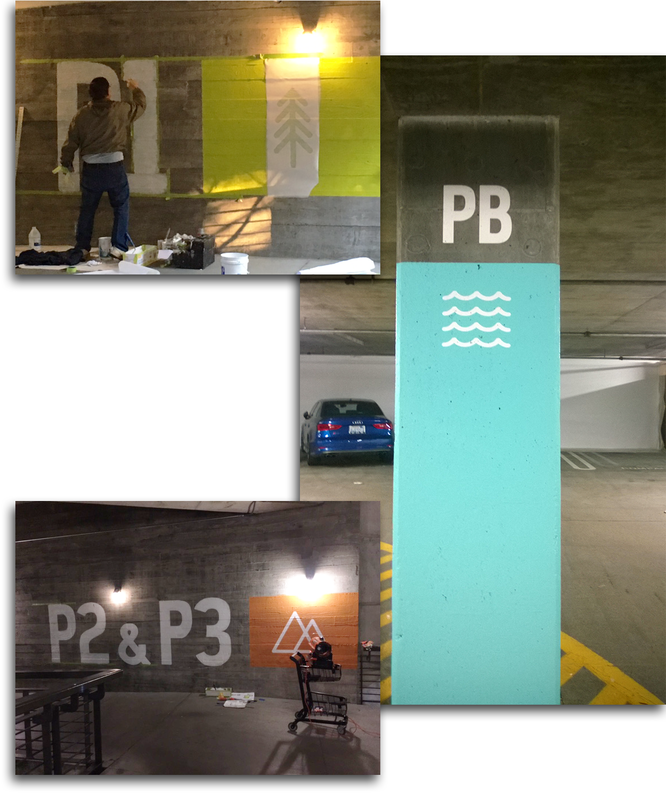 Hand painted large “P1” and “P2" & "P3” wayfinding graphics, leading to the parking garage. © 2018, Commercial Displayers, Inc.